Corporate Social Responsibility (CSR) assesses the impact that businesses have on its local community and environments. We at Allington Hughes Law want to have a positive and sustainable impact on our surrounds, whilst also respecting each other. We want to be socially, environmentally and ethically accountable to ourselves, our clients, our stakeholders and the public. At Allington Hughes Law, we recognise our corporate responsibility commitments, which are reflected in the principles below. Allington Hughes Law believes in supporting, encouraging dialogue with and investing in the local community. We have supported St Christopher’s School in Wrexham, with their sensory room, mini bus appeal and art projects, and also the Wrexham Symphony Orchestra. Allington Hughes Law has contributed towards Christmas trees in Wrexham, Llanrwst and Chester Cathedral. Wherever possible, the firm supports local events, for example the annual Llanrwst show. We are members of the Chester Civic Trust which aims to preserve Chester’s heritage. Allington Hughes Law has established connections with local businesses, for example we support and have numerous members of the Wrexham & North Wales Young Business Professionals. We have solicitors who are proud to be mentors of future lawyers, for example students at The University of Law, Chester, and many students on legal committees, including that of Chester & North Wales Branch of CILEx, Cheshire and North Wales Law Society, YRes and Cheshire and North Wales Junior Lawyers Division. On a personal level, numerous members of our staff have roles within their local community groups, for example in various charities, schools, sport teams, sport associations and churches. Allington Hughes Law strives to provide a high quality level of service together with good value for money for our client community. Allington Hughes Law includes all. We have disabled access to all offices and will visit disabled clients at their home, where necessary. We also have communication systems for those with visual impairments who struggle with mainstream literature. We believe justice should be available to all by offering free drop in clinics and are a Legal Aid firm. Allington Hughes Law fully encourages students to gain work experience in our offices and offers training contracts to support the next generation of lawyers. We offer a bilingual service in English and Welsh in order to be able to include both national languages of our offices. Some of our team members in appropriate departments are dementia friends, meaning they understand how to include those living with dementia in discussions better. We aim to deliver a fair employment environment by giving individuals the opportunity to develop and advance, subject to performance and business opportunities, whilst safeguarding them to be treated without any harassment. We are proud to be a firm that has no gender discrimination which is often experienced in the legal industry, with 61% of our fee earners being female. Read more about this here. Allington Hughes Law endeavours to reduce our impact on the environment through a commitment to continual improvement directed at reducing our environmental footprint, wherever possible. We have a green champion in our firm, and a green representative in each office. We recycle all card, paper, pens, toners and old computer equipment, and reduce our use of paper at all available opportunities. We have eliminated plastic cups in our office. Allington Hughes Law chose a confidential waste management company due to the charitable events they organise and their recycling program. We fully encourage staff to use public transport or cycle to work and have bike storage at our offices. Allington Hughes Law is proud to support many charities and good causes. Charity events we have supported include the Nightingale House Hospice Christmas Fair, The Countess Charity Laughter Lunch and the Hope House Duck Race. 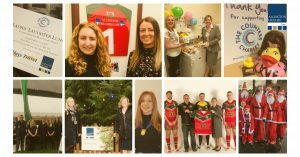 Our staff have partaken in charity events including Chester’s Santa Dash, Dragons Lair, bake offs, climbing Moel Famau for The Clatterbridge Cancer Centre, the Operation Christmas Child shoebox appeal and Christmas Jumper Days. We had a team who were locked up in a Mold Police Station for the night for Tenovus Cancer care. We have members of staff who are heavily involved with charities outside of work, for example in The Wrexham Rotary and Deeside Round Table.